Cherry barbs originated from Sri Lanka but these days they are found in Colombia and Mexico also. As they live in the calm waters, they can easily adjust themselves in aquariums and tanks. They are basically middle tank fish meaning they love to stay in the middle level of the aquarium. They will rarely come to the surface of the water but sometimes they can make a trip to the bottom of the aquarium, searching for food and places to hide. They are freshwater fish and are comfortable in moderate conditions of water. You should avoid making sudden changes in the temperature of water because it will harm them. You should also take care while changing the water of the aquarium because a sudden change in the water chemistry can put them under stress. Like any other barb species, the females are bigger in size than the males. However, the males will be more colorful. The combination of various shades of cherry red color will be prominent on the males. The females will be in dull colors, especially orange and yellow. 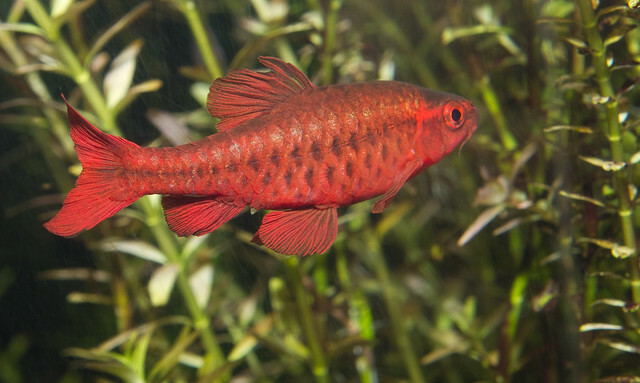 In the open nature, cherry barbs will not spawn frequently but in aquariums, they will be very fast! During the period of spawning, the colors of the males will become brighter. The females will scatter their eggs all around the aquarium. However, you should take care to protect these eggs because the males will eat most of them. So if you transfer the eggs to another tank, there is a bigger chance of getting a large number of new ones. Cherry barbs are very peaceful in nature but there are some exceptions. At the time of spawning, the male becomes very aggressive. Also, if you keep the only a few of them in the aquarium, they will develop stress and become aggressive. So it is advisable to keep them in a good ratio of three females per male. The normal size of their group should be about 10. During the breeding season, the male will constantly follow the female and will try to keep away the other males. The females can lay about 300 eggs every day. Normally, cherry barbs are not comfortable with other species of fish but if you keep them with the bottom-feeding fish like Loaches it can make a better combination. The Loaches are normally shy by nature and like to hide all the time but in the presence of cherry barbs, they will become more playful and both of them can make a good community in your aquarium. Never make the mistake of keeping other species of fish with the cherry barbs. Even if you plan to keep tiger barbs with them, it is not advisable. Tiger barbs are aggressive species and they will attack and nip the cherry barbs. Angelfish are beautiful and usually peaceful but if you keep them with cherry barbs, there will start looking at cherry barbs as their tasty food! Cherry barbs are fine with the normal fish food like flakes. They like live food such as brine shrimp or blood-worms as well. However, you should occasionally feed them with green vegetables like lettuce or spinach for proper nourishment. If you take proper care of cherry barbs, they will grow up to 2 1/2 inches and live up to five years. You should provide them an aquarium with a heavy plantation because it is useful both for keeping their health as well as for their breeding.